Contestants play Ellen's action-packed games for a chance to win $100,000. Dilemma of Having an R. Kelly-Penned Hit: Sing it or Sink it? Left: R. Kelly attends a red carpet event on Dec. 13, 2013. Right: Lady Gaga arrives at an award ceremony on Nov. 29, 2018. For Grammy-nominated singer Joe, singing the hit song R. Kelly wrote and produced for him is out of the question. "I've stopped performing the song," he said in a statement to The Associated Press, referring to "More & More," a Top 20 R&B song released in 2003. "No music or intellectual property is worth being inconsiderate to the feelings or pain of others," 45-year-old Joe continued. In the wake of multiple sexual abuse allegations against R. Kelly — which intensified this month with the release of the Lifetime documentary series "Surviving R. Kelly" — some performers are denouncing songs the R&B hitmaker created for them. Sometime ago Jennifer Hudson removed two songs R. Kelly wrote for her from some streaming platforms, including YouTube and Apple Music: the Grammy-nominated "It's Your World" and "Where You At," a Top 10 R&B hit. On Thursday, she removed "Where You At" from Spotify but "It's Your World" was still available. R&B star Fantasia told the AP she would no longer perform "Sleeping With the One I Love," her Grammy-nominated 2016 single written by R. Kelly. "I simply cannot, in good faith, continue to perform 'Sleeping With The One I Love.'" In support of all of the survivors who so bravely came out, the track will no longer be a part of my setlist for all future performances," the former "American Idol" champion said. 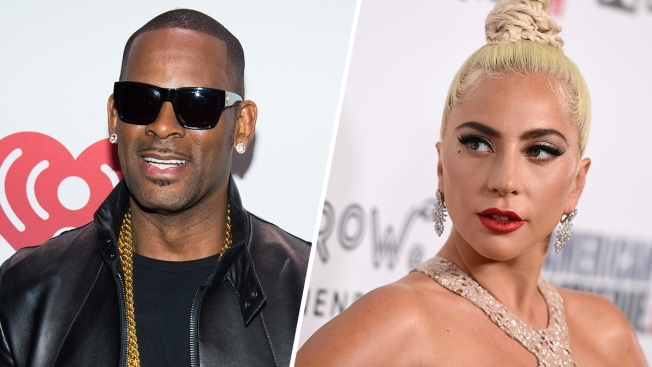 Lady Gaga apologized for her 2013 duet with R. Kelly, "Do What U Want," and removed the track from streaming services. Celine Dion followed Gaga's footsteps, removing her Grammy-nominated duet with the embattled singer, titled "I'm Your Angel," from streaming platforms. And B2K, the boy band whose only song to the top the Billboard Hot 100 chart was the R. Kelly-produced "Bump, Bump, Bump," said after their reunion tour, which kicks off in March, they will no longer perform that song, or the others R. Kelly crafted for them. "After the tour I am retiring those songs from my set list," lead singer Omarion tweeted. "I too am raising a future queen." R. Kelly, who has denied all allegations of abuse against him, has written and produced his own hits like "I Believe I Can Fly" and "Bump N Grind." He was once a white-hot hitmaker that most artists clamored to work with. R. Kelly was behind Michael Jackson's "You Are Not Alone," which became the first song ever to debut at No. 1 on the Billboard Hot 100 when it did in 1995. He also worked on multiple songs for Whitney Houston's final album, 2009's "I Look to You." He produced "Age Ain't Nothing But a Number," the 1994 debut album for Aaliyah, who was 15 when she married a 27-year-old R. Kelly the same year the album was released. The marriage was later annulled. Aaliyah's album included "Back & Forth," a Top 10 hit on the Billboard Hot 100 chart; other Top 10 hits R. Kelly crafted for others included "Stroke You Up" and "G.H.E.T.T.O.U.T." for R&B duo Changing Faces; "808" for the girl group Blaque; and Maxwell's "Fortunate," the crowd favorite he performed at the last stop of his tour in New York in December. But will he sing it again? Several artists, through their representatives, didn't return multiple email requests from the AP asking if they would continue to perform songs R. Kelly wrote for them, including Maxwell. A rep for Kelly Price, whom R. Kelly has worked with, declined to comment. R&B singer Syleena Johnson told the AP after looking closely at the lyrics of her debut song, the R. Kelly-penned "I Am Your Woman," she can no longer perform the track. She said she got goosebumps just thinking about how she sang lyrics like "Now I've been dealin' with you since sweet 16/Woman enough to let you raise me/You used to call me daddy's ghetto queen" for roughly 20 years. Toni Braxton is currently on tour but it's not clear if she's performing "I Don't Want To," a hit song R. Kelly wrote for her multi-platinum sophomore 1996 album, "Secrets." R. Kelly signed R&B singer Sparkle and produced her 1998 debut album, which included the hit "Be Careful" (Sparkle alleges Kelly sexually abused a young relative). And he even produced a mild hit for Britney Spears, 2004's "Outrageous." R. Kelly also contributed to the careers of veteran acts like the Isley Brothers and Charlie Wilson, helping the seasoned performers find a home on contemporary radio alongside acts half their age (Wilson said last year he would not work with Kelly again). Gospel singer Marvin Sapp's "Listen" was written and produced by R. Kelly and peaked at No. 2 on Billboard's Hot gospel songs chart last year. Though "Listen" was a success, Sapp has become a 11-time Grammy nominee thanks to his No. 1 hits like "Never Would Have Made It," ''The Best In Me" and "My Testimony" as well as "Praise Him In Advance," a No. 2 hit. Sapp said in a statement to The Associated Press he is praying for R. Kelly. "Based on my biblical studies, I have always been an advocate that the message of the Gospel of Jesus Christ is bigger than the messenger. This is a guiding principal for me. When I was recording my most recent album, I was presented with the song 'Listen,' written and produced by R. Kelly," he said. He continued: "It struck me immediately as a song with a powerful message that needed to be heard, and as a song that I needed to record. With the recent airing of the 'Surviving R. Kelly' docuseries (which I have not seen), the world is chiming in and taking sides. My sentiment remains the same: I am not called to cast stones or pass judgment on anyone involved. My responsibility, and my heart, is to pray — for everyone involved," he said. He took pains to note that "praying for someone does not equal supporting them and it does not equal defending them." "My prayer is that R. Kelly and everyone involved are restored and redeemed — body, mind and spirit." Fantasia echoed some of Sapp's thoughts. "I am a mom and I've had the chance to work with him and you know, I got to see a lot of things. I did. So, the best thing my mother always told me is — you have to pray for people. You have to pray for them and that's just what I'm doing now," she said in an interview with the AP. "I'm praying for him and I hope that some things change because I am a mother and it breaks my heart."